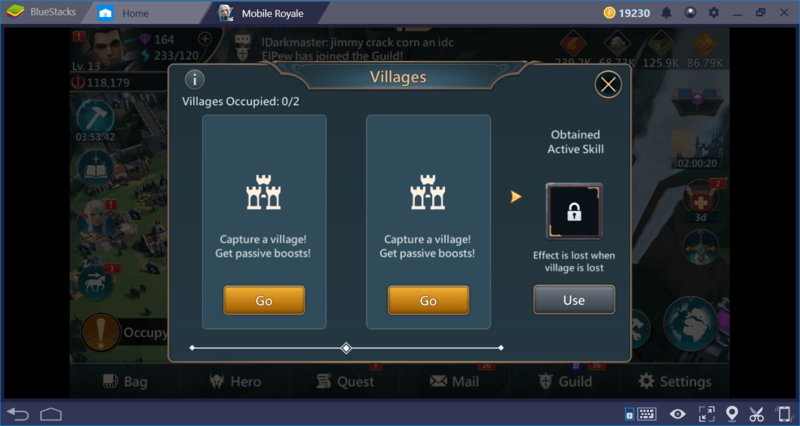 Mobile Royale is one of the most advanced conquest games currently available and contains very complex systems. Even if you’ve played a conquest game before, you’re still going to need help: The different mechanics and features require you to spend a long time to get used to the game. You can shorten this period by reading the guide we have prepared for you and make your kingdom grow faster. 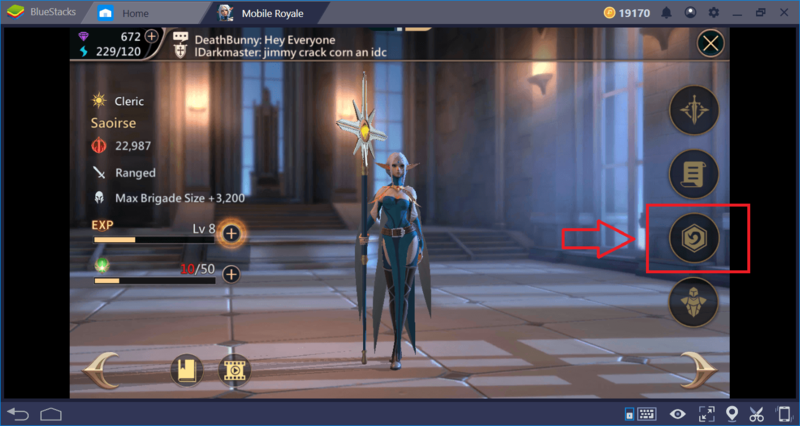 One of the reasons why Mobile Royale is different from other conquest games is that it has a very practical interface. There are so many things you can do in this kind of games that sometimes you can forget what to focus on. 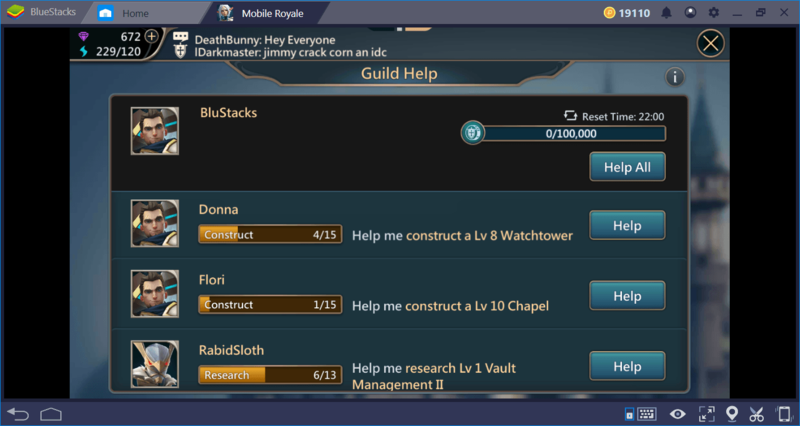 Mobile Royale solves this problem with a special “advisor” screen. 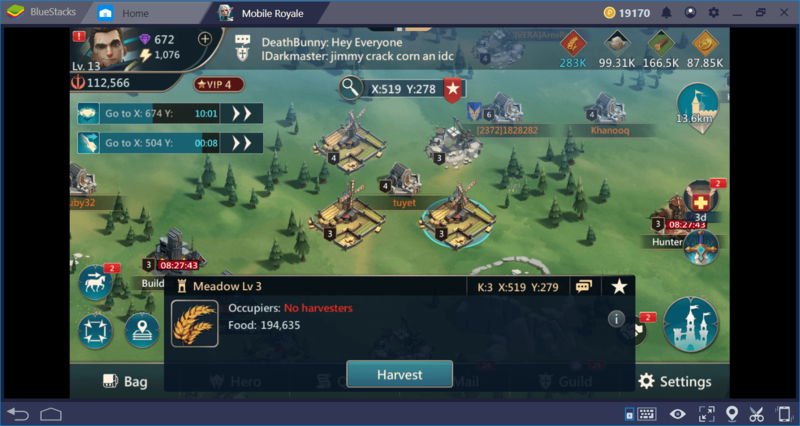 Whenever you think “what to do now”, you can open this screen and take an overall look at your kingdom. This screen not only tells you what to do, but it also provides shortcuts for them. 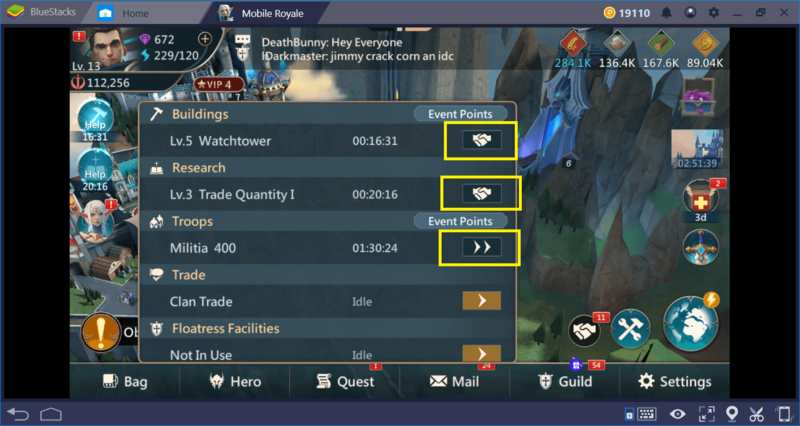 At a single glance, you can see the orders you need to give and use buffs to complete these tasks faster. In other words, you don’t need to navigate through your inventory or switch between multiple screens: Advisor screen always lets you see all the required information and contains the shortcuts you need. Therefore, we recommend that you open this screen every 15 to 20 minutes and get an overview of your kingdom. 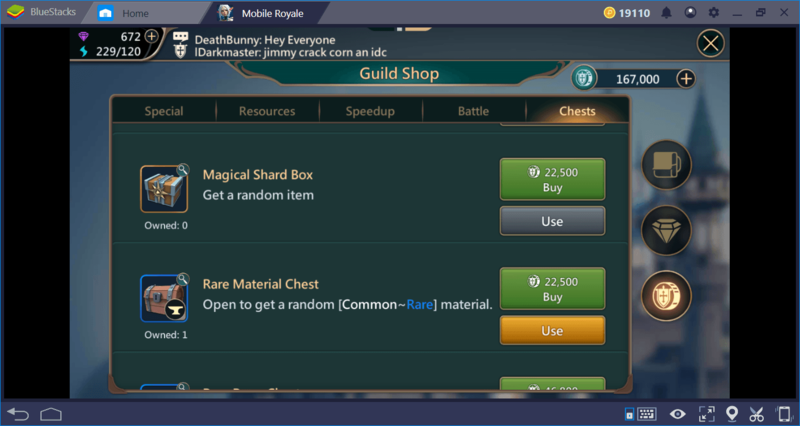 But most importantly, you can get access to the Guild Shop and purchase resources, buffs, and chests in exchange for coins, which you can win for free. For example, scrolls that allow you to shorten construction time by 3 hours are sold here. Or, you can find some of the chests that normally require real-money payment and buy them easily. 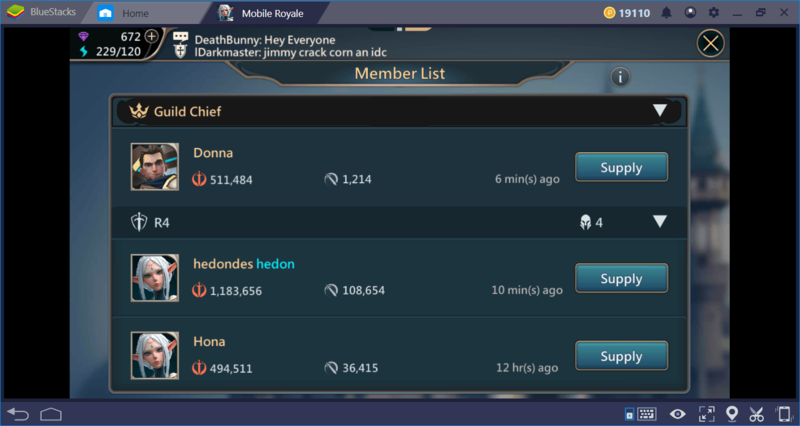 In short, as soon as you start the game, join a guild or create your own guild. In another guide, we give you detailed information on how you can do this. Have You Noticed The Diplomat? Here he is, standing alone. Diplomacy allows you to communicate with three different clans and exchange resources. The clans in the game always need something from you: If you comply, you can raise your friendship level and get different research bonuses. You can’t get these bonuses any other way and some of them are really useful. In addition, you can earn player XP and might points. 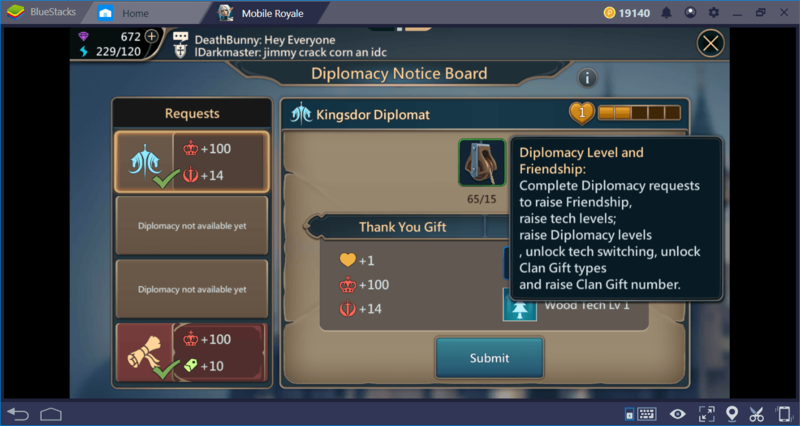 Don’t forget to check the diplomacy screen frequently: The more requests you receive, the more bonuses you get. You can be sure that the extra might points you get this way will be very useful at the end-game phase. From this screen, you can see what the effects of rune stones are. You will win rune stones by completing the campaign quests and some will come out from the crates. But if you’re not careful, you don’t realize you won them as a reward. 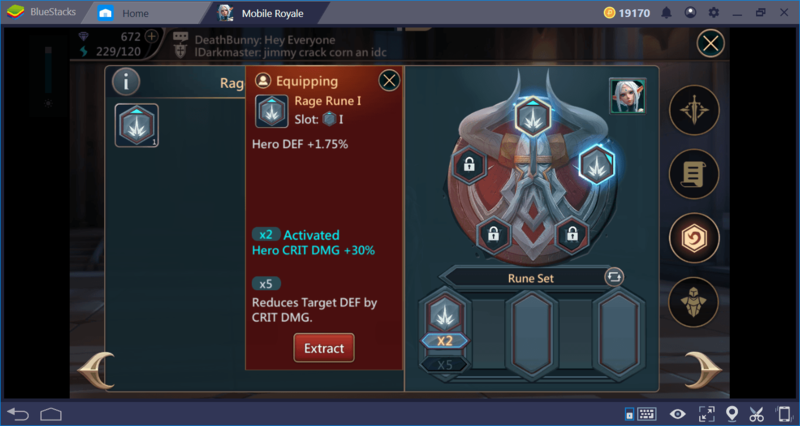 So check frequently for rune stones and always make sure your heroes are equipping them. Your first job should be checking the world map as soon as you start the game. 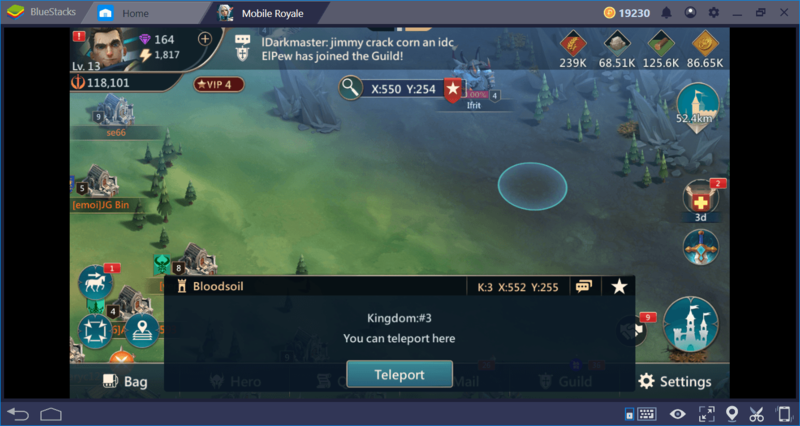 As mentioned in our Mobile Royale review, the resources you produce in your kingdom will not be enough after the mid-game phase and you will be forced to use the resources on the world map. If you are lucky enough, you may be already near to some of these spawn points. This means that within a few seconds you can gather any missing resources without having to enter a battle. This player doesn’t realize how lucky he is: He is surrounded by multiple spawn points. 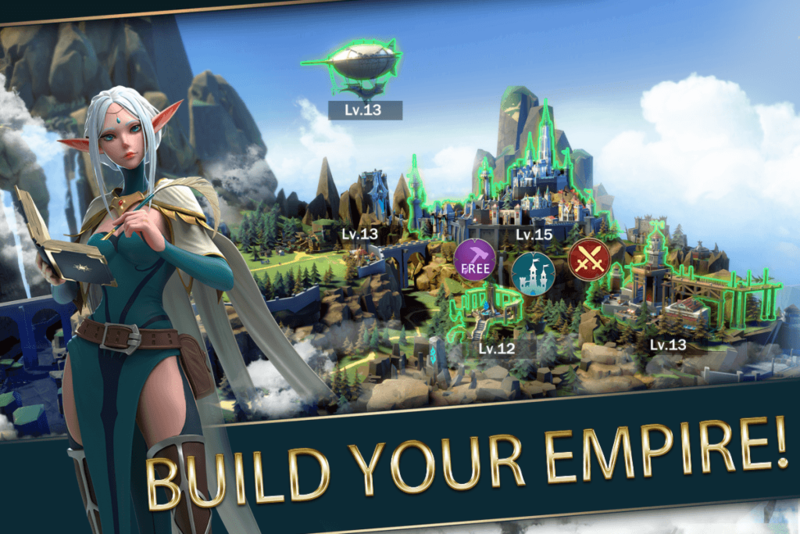 However, such a situation may be disadvantageous in some respects: Other players may want to invade your kingdom when they are attacking the resource points in your neighborhood. Or, you may want to move your kingdom to a richer location on the map. In any case, you can solve this problem by using teleport scrolls. When you start the game, you will get two free scrolls. After that, you can purchase them at the guild shop. Teleport scrolls await you in your inventory. 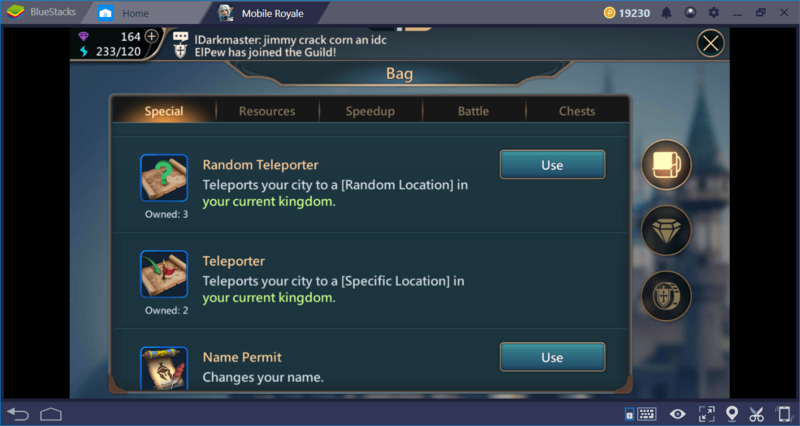 You can choose where you want to teleport. Finally, remember that there are NPC towns that you can occupy on the world map. These towns are not under the control of any player and invading them allows you to get different passive bonuses. 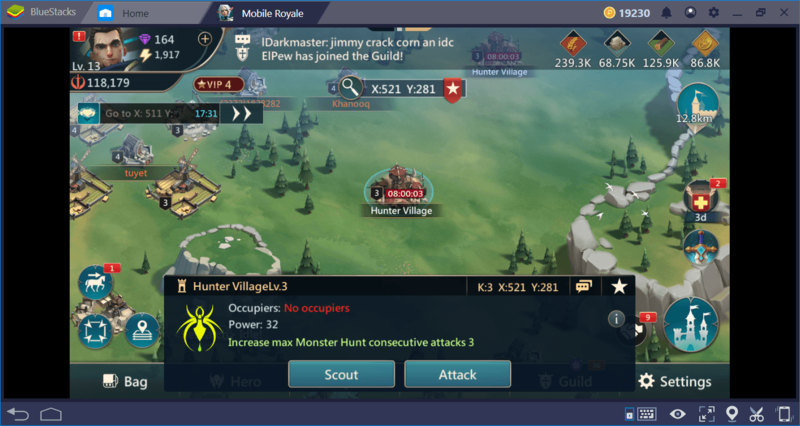 You can occupy this town – do not waste time by scouting, it is not very difficult to conquer them. You can manage your bonuses from this screen. As long as you make the right decisions, it’s not that hard to grow your kingdom. With this guide, you have learned how to handle many things easily: Now, you can start creating the most powerful kingdom in the world. 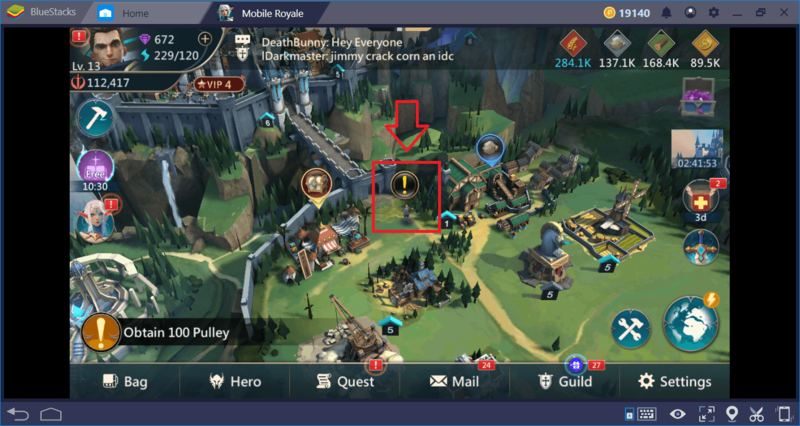 We recommend that you also take a look at our other Mobile Royale guides, all of them contain useful information that will help you further. If you have suggestions and tips, please let us know in the comments section. Good luck! 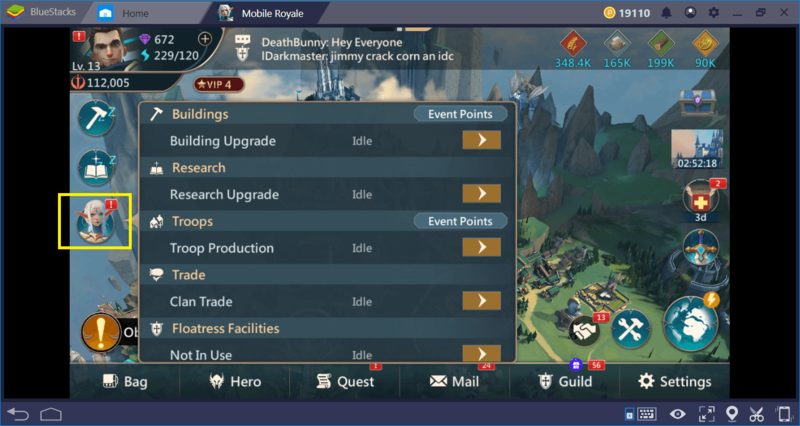 Mobile Royale Battle Guide: Let’s Conquer The World!